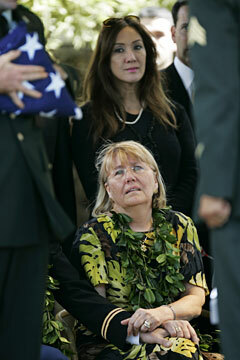 Army Col. James Olsen and Lis Olsen, parents of slain soldier Toby Olsen, held each yesterday other as Chariya Tseu performed a hula in Toby Olsen's honor to end the service at the National Memorial Cemetery of the Pacific at Punchbowl. Former Hawaii resident Toby Olsen's thoughtfulness and zeal for life was expressed through his words, MySpace.com profile, actions and ever-present smile, according to friends and family who bid their final aloha yesterday to the 28-year-old Army specialist. Olsen died Jan. 20 after an explosion hit his vehicle in Iraq. Services were held yesterday at Borthwick Mortuary, and he was buried at the National Memorial Cemetery of the Pacific in Punchbowl. In his MySpace profile, Olsen wrote about why he joined the military. "I hit a point in life where, though my art wasn't fulfilling anymore, it felt empty. I suddenly had too much freedom, and too much time, so I took the most opposite direction I legally could with my life. I joined the Army," he said in the profile. His father, Army Col. James Olsen, talked about his son's achievements and transformation after joining the Army, including passing airborne training, becoming a top marksman and getting in tip-top shape. But his mother, Lis Olsen, said the physical exertion that came with military life was uncharacteristic of the aspiring artist and art teacher. "Toby would much rather sit and talk story, draw, watch TV and play video games than any physical exertion when he was younger," his mother said in a prepared statement. "If he could find a way to sweep floors or wash dishes in a sitting position, he would." Olsen was based in Fort Richardson, Alaska, and deployed to Iraq in October with the 3rd Battalion, 509 Infantry (Airborne) Regiment, 4th Brigade Combat Team, 25th Infantry Division. Before Olsen went back to Iraq after rest and relaxation in Germany, his father said he saw "great sadness in his eyes," despite his piercing smile. "He hid his fears and concerns from his parents well," his father said. "Until it hits you or your family, you don't really understand it. And then once you do, it's just devastating." Olsen was remembered by his family as a marching-band aficionado, bass guitarist hanging out at a Wahiawa cafe, a former tattoo artist and sculptor, and a die-hard fan of singer Tom Waits. In his MySpace profile, Olsen described himself as a "very social loner." "I know a lot of people, but I really don't have many close friends anymore," Olsen wrote. "I think about things a lot -- sometimes too much, sometimes not enough." Former KGMB-TV sportscaster Larry Beil, one of Olsen's uncles and now a sportscaster in San Francisco, said it becomes all too easy to become conditioned to hearing stories about faceless, nameless dead soldiers. "Until it hits you or your family, you don't really understand it," said Beil, fighting back tears. "And then once you do, it's just devastating." Lis Olsen held the hand of her husband, Army Col. James Olsen, yesterday as the American flag that was draped over the casket of their son, Toby, was folded. The flag was then presented to the parents at the end of yesterday's service at Punchbowl. Before the burial at Punchbowl, one of Olsen's friends, 27-year-old Chariya Tseu, performed a dance number to "Friends," by Na Leo Pilimehana. The dance was once performed by Olsen and his mother when he was attending the Iwalani School of Dance, and Tseu felt it was an appropriate sendoff to her old friend. Tseu, who was Olsen's prom date when he was a senior at Mililani High School, said she was able to see Olsen during a visit to Hawaii last month. Contrary to his past habits, Olsen would run from his hotel to Tseu's work to say hello. "He would come over to show off his new body," Tseu said. "I really don't mind talking about my memories of him, because when I saw him, we had a lot of fun." Olsen was born in Germany and was living in Manchester, N.H. He is survived by his parents, brother Michael of Mililani, sister Tanya of Germany and grandparents John and Hiroko Olsen of Wahiawa, and George and Hedy Tiedemann of Casino, New South Wales, Australia.